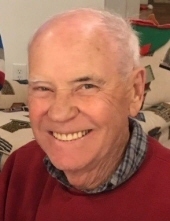 James Randall Hilyer 75, of Taylors died on January 22, 2019 in Greenville SC. Born on January 1, 1944 in Mineral Springs, Alabama, he was a son of the late John Fonza and Gretchen Coffer Hilyer. He retired from C.I.T. Financial Corp. He was a devoted husband, caring father and passionate grandfather. Jim gave his time and services freely to those around him. He believed in God, telling the truth and that a man was only as valuable as his word. Jim's greatest loves were his grandchildren, growing tomatoes and Alabama football. Please pray for his survivors, his wife Nell Hilyer, his daughter Rena Stevens (Bryan) and his two grandsons Stiles and John Matthew Stevens. He is also survived by siblings, Helen Coffer, Betty Headley (Leo), Frances Gore, Bernice Weatherly (Bill), Robert Hilyer (Irene), and Brenda Rhodes; and a number of nieces and nephews. He was predeceased by brothers, Jimmy and Raymond Hilyer. A service to celebrate Jim’s life will be held at 11:00 am on Saturday, January 26, 2019 at Taylors First Baptist Church with a visitation prior to the service from 10:00 am until 10:45 am. The family suggests memorial donations to the Appalachian County Agency on Aging-Caregiver Support Program, 30 Century Circle, Greenville, SC 29607. They were a wonderful resource to Jim’s family during stressful times. "Email Address" would like to share the life celebration of James Randall Hilyer. Click on the "link" to go to share a favorite memory or leave a condolence message for the family.